The interaction between philosophy and clinical psychopathology in the form of the 'phenomenological movement' was one of the most significant events to occur in mental health over the course of the last century. As the gulf between 'analytical' and 'continential' philosophy reduces, and as clinical psychiatry looks beyond DSM-IV and ICD-10, there is renewed enthusiasm for phenomenological thinking. This unique book brings together and interprets previously hard to find texts, new translations and passages detailing the interplay between philosophy and psychopathology, making them accessible to a new generation of mental health researchers, practitioners and policy makers. 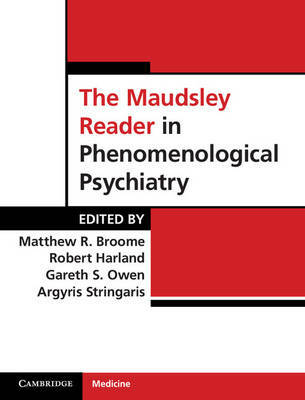 The content charts both the influence of key philosophers on ways of thinking and describes the impact and influence of phenomenological approaches to clinical work and understanding in a variety of mental disorders.